Winter is the best time to indulge in a little comfort food (or desserts). Luckily there are endless dessert choices in Shanghai. Whether it’s the sweet delights from Macau or the simple, yet elegant pastries from France, Shanghai offers an abundant number of sweets and treats. Satisfy your sweet tooth with this list of the best eight dessert places in Shanghai. 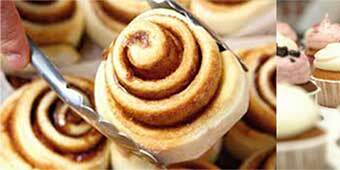 1) CinnaSwirl offers homemade cinnamon rolls. Like the shop’s slogan “a taste of home,” the cinnamon rolls do indeed taste like the ones from in the States. They are the softest, sweetest cinnamon rolls. These cinnamon rolls are made fresh, so for orders made online allow at least two hours before your pickup time. Orders made online are only for pickup, if you’d like your order delivered use the Mealbay website. CinnaSwirl offers the classic cinnamon rolls for pickup and delivery, as well as in store. However for the special varieties, such as cinnamon rolls with walnuts or caramel apple, you’ll have to order them online, as they are not always available at the shop. 2) Baker & Spice is a concept of the Wagas Group. The Wagas Group has many restaurants and cafes that use fresh ingredients, and appeal to those looking for high quality food. Baker & Spice is an artisanal bakery with several locations throughout Shanghai. They bakery offers salads, sandwiches, pastries, handcrafted breads, and imported wine. Their most scrumptious dessert is the raspberry flavoured Berliner donut. There are several locations in Shanghai, so make sure to check the website for a complete list of locations. 3) La Crêperie is one of the most authentic crepe places in Shanghai. They have a couple of locations in Shanghai as well as throughout Asia; make sure to visit the website for a full list of locations. The “La Vague,” or salted butter caramel crepes is a must try. And for chocolate lovers, try the “Le Voilier”; it comes with salted butter caramel and chocolate. La Crêperie offers a variety of other desserts such as cakes and homemade yogurts. They also have an extensive lunch and dinner menu, including vegetarian options. The restaurant serves a variety of dishes from the Brittany region of France. 4) Pain Chaud (西式甜点) is a cosy French style cafe on Yongkang Lu—the lively expat-filled bar and restaurant street. Pain Chaud was formerly known as La Boulangerie. They offer a selection of mouth-watering éclairs and the most moist banana chocolate cake ever. They also have a variety of French breads, cakes, and the hottest croissants in town. Pain Chaud is also known for having great coffee. 5) Lillian Bakery (莉莲蛋挞) has numerous locations around Shanghai. These Macau-style egg tarts are beyond this world—they melt in your mouth. They are relatively inexpensive, warm, and sold individually or as a boxed-set. Although their famous egg tarts usually get people to come in for a visit, they also offer other delicious desserts such as fruit tarts and cheesecakes. 6) Strictly Cookies are definitely the best in town. The cookies are available at many shops, cafes, and restaurants around town, including Spread the Bagel, Hungry Lung Kitchen, and Avocado Lady. These cookies are made daily, so they’re warm and straight out of the oven. Delivery is also available, check the website for more details. If you want to pick up a batch of freshly baked cookies then stop by at one of their shops. 7) Lollipop Bakery first opened its doors to cupcake-hungry customers in Beijing back in 2009. Since then they have expanded to Shanghai, and they’ve brought with them the same freshly baked, moist cupcakes with their famous buttercream frosting. The Red Velvet cupcake is scrumptious, and definitely worth a try. Lollipop Bakery sells its cupcakes at Pantry and Sumerian Café, but you can also order them online or by phone and have them delivered straight to your door. 8) Gracie’s Ice Cream offers a variety of classic favourites, such as Vanilla Bean, and Chinese-inspired delights, such as the Black Sesame & Honey. Gracie’s ice creams are made using high quality imported milk and cream. The “Chocolate Blackout” is highly recommended for those who love chocolate! There are delivery options available; delivery fees may apply, so check the website for details. Selected flavours are also available on Kate & Kimi and Sherpas. But you can always pick up a scoop at the Gracie’s Ice Cream Café, located in the heart of the Former French Concession. You'd have to be a complete fool to waste your hard-earned money on "Western" desserts in China... all that disgusting fake cream, urgh! These all seem to be Western dessert food. I wonder what the best places are to get Chinese desserts in Shanghai.